I received a total of $777.63 of dividend income in January. Setting another dividend income record for the month of January and typing that out NEVER gets old. Additionally, my wife earned $37.85 this month and I am still debating on how to incorporate that into the analysis, which I don’t mind this problem, right? Further, the 401(k), Health Savings Account (HSA) and all dividends are automatically invested/reinvested and helps take the emotion out of timing & making a decision. Also, to find out why I max out my 401(k) and HSA – please refer to the 3rd part of my tax series, (though I have the breaks on the 401k, as I recently posted due to the 6 month waiting period, a few days away baby (first contribution on the 8th)!) as that describes the magnitude of benefits to increase the amount you can invest due to reduction in taxes. 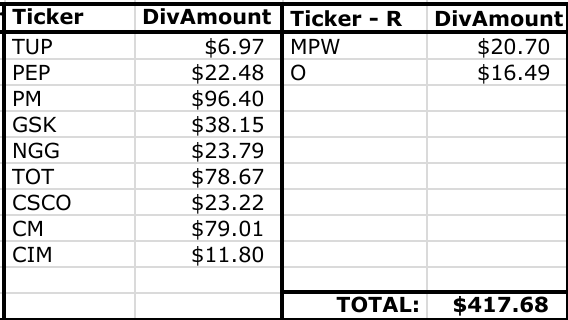 Here is the breakdown of dividend income for the month of January! Interesting month to say the least. A few new companies here, such as Iron Mountain (IRM) coming in with a nice dividend in the retirement account – love having high yielders there and not having to pay tax on that. Further, Bed Bath (BBBY) came in with a solid dividend with a decent reinvestment. In addition, Illinois Tool Works (ITW), Leggett and Platt (LEG) and Occidental Petroleum (OXY) are newer positions and fun seeing the first few dividends coming in from them. Then, of course, there is the big whopper in Philip Morris (PM) and they came in swinging with the triple banger. Similarly, there was solid reinvestment on them. 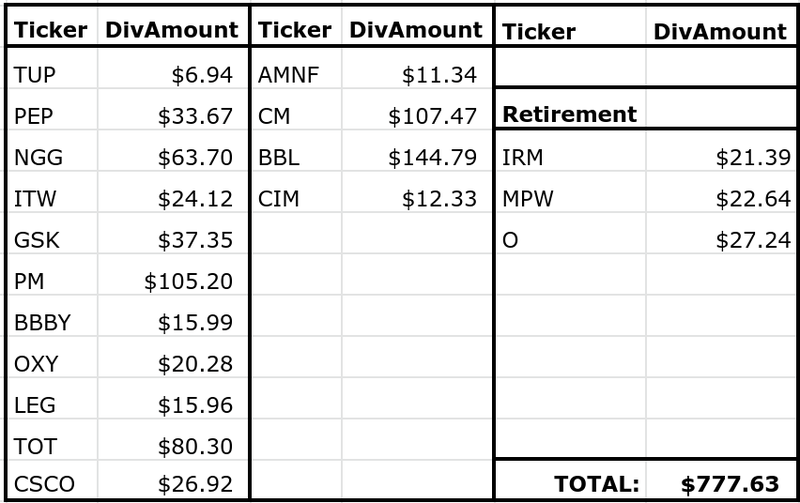 I have split out between the individual stock amounts and the retirement accounts, as the ” – R” indicates a retirement account dividend (or the furthest column to the right). I separate these two, as I like to know what portion of my dividend income is coming from those retirement accounts that I cannot touch until 59.5 (barring any other usage rule I could use). Here, it shows that I received a total of $71.27 (up from $37.19 last year) or 9.2% of my income from retirement accounts and the other 90.8% was from my individual taxable account portfolio. This ratio increased from last year due to Iron Mountain, primarily. Lastly, this shows from retirement accounts that I’m all ready for my set it and forget it mentality to keep that income going. To see my portfolio – one can go to our portfolio summary page. Now, I will compare the previous year’s linked month to this month. Not only did I cross $500 from last January, but I fricken eclipsed $700, wow! 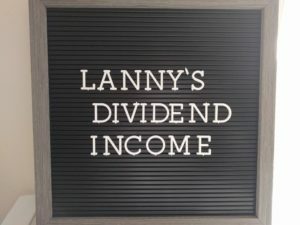 In regards to the actual growth rate, my dividend income was up 86%! My goal is to be well over $900, if I can, in dividend income next year. Quite a few names here, such as Armanino Foods (AMNF), Bed Bath & Beyond (BBY), Occidental (OXY) and Leggett & Platt (LEG). So many new players that are paying income now, and I almost left out Iron Mountain (IRM). In addition, all the new players increased their dividend in 2018, so I have dividend growth backing the new players as well. The list continues to grow, which is awesome, and outside of damn Tupperware (TUP) cutting their dividend, everyone else is pushing stronger ahead with their payouts. The remaining increase in the taxable account was due to the other two legs of the dividend stool, which are reinvestment and increases. What a great start to the year! Three strong dividend increase announcements. Further, this DOES NOT include BHP Billiton (BBL)’s MASSIVE dividend announcement of $2.04 versus the $1.26 paid last time. I think we can calculate a growth rate on that. Did anyone also see that from BBL? Feel free to correct me here. Realty Income (O) continued their first month of the quarter dividend increase at 2%. This was slightly lower than anticipated, and would believe they may only reach an approximate ~3% growth rate this year (as they are usually around ~0.25% at the other quarters). Lastly, the big surprise – Aflact (AFL) and big shout to DivvyDad for first bringing this up. They went off of their normal schedule and gave us a nice 3.85% increase! Further, in order to add $33.03 to my dividend income, I would have to invest $943.71 at 3.50%! I needed this, especially after a nice little Tupperware (TUP) dividend cut. This was THE SMALLEST company I have, so the dip in forward dividend income was negligible, good thing for owning a 50+ basket of stocks! There is a nice adjustment to my most recent monthly expenditures article. My property taxes increased by 14%. Therefore, my new average is around $1,040 per month, on the mortgage/property tax/insurance. Therefore, my current dividend income would cover almost 3x my average $1,040 monthly expense, which includes the mortgage, property taxes, insurance and utilities. If only this was all taxable and happening each month, I would be financially free, no doubt! What a month, everyone, what a month. In similar fashion – all of the investing from last year and moves this year, shows that my aim to save 60% of my income, and making every dollar count, has allowed promising results already this year. We are warming up now that the Vortex has passed us! Further, we are one month out of twelve down… how wild is that? We are doing this, it’s real and it’s LIVE. I can see the power of dividend investing, can’t you? Investing, reinvestment and dividend increases work their magic, OH so much. I cannot be any more thankful for this journal, community and being able to share this with everyone. I truly hope that you can see the power of this, in hopes of brightening your financial journey. Thank you again, good luck and happy investing! This entry was posted in Monthly Summary and tagged Dividend Income, Dividend Reinvestment, Financial freedom. Bookmark the permalink. That is a massive yr over increase on those kind of numbers. Thank you! The div increases are great, wish I didn’t have that TUP cut, though. Great start to 2019 Lanny! We didn’t have near the growth that you did although that was largely due to not investing any fresh capital. That being said our dividends still climbed higher by 22% so there’s no complaints from me. Plus we had 6 dividend increase announcement which is just icing on the cake. If I’m not mistaken the BBL $2.04 payment was a special dividend. I almost added some shares to get that special dividend as well as the likely to grow dividend Between that special dividend and the next semi annual payout, assuming no increase, that would have been over a 7% yield and you’d still have a 2nd semi annual dividend coming. I’m ready to get the dividend increases coming for this month as I expect a fairly active month in that regard. ADM started it off today with a solid and expected raise 4.5% increase. Not bad for a new position for my portfolio! Just amazing, 22% is just awesome. You’re right about BBL, just tossing a little extra cash towards the shareholders, I’ll take it. And yep – ADM kicked it off for me and excited for who is next! Awesome month, minus TUP. I feel your pain there, I offloaded my shares the second I saw the dividend cut news. Good bye and good riddance there. Otherwise, so many other positives that that cash will just be a nice bump for my next purchase(s). Love that you are wiping your hands clean!!! wow nice income there especially PM is really impressive. Honestly I am also a bit jealous about BBL, unfortunately I never took the opportunity to make an investment. The BBL really is coming back strong. Trust me, though, there were periods in my short time period of owning them, where they didn’t perform as well and even cut their dividend. However, the last two years have been fantastic. That’s a crazy year-over-year increase, even with 2018 being a significant number! Congrats on making it through the vortex. Thank you very much! We made it through the Tundra. Man oh man… glad the dividends were there to keep the house warm! What’s funny is I never noticed the 777 when finalizing my income. I feel like I really hit it big, so lucky and gosh damn fortunate. The Triple 7’s here represent: Capital, Reinvestment, Increases. That’s the jackpot we can all win at. Lanny this is arguably the best month you have ever had. All those dividends and to top it off you have some massive increases worth almost another thousand invested. How great is that. Well done. I truly & humbly appreciate that comment. I say that because it’s January and this has been such an impactful month, from where I was January of just last year. Seeing the trifecta of new purchases, increases and reinvestment & what that has done to my income, is beyond me. Thank you, thank you, thank you. Now that’s a strong start to 2019. With triple 7s coming in for the month it looks like now may be a good time to head to Vegas. I’m liking that PM amount. Makes me think I should still be adding to my tobacco names as they are still beaten down despite their climbs from recent lows. Keep it going strong in ’19! *Insert Plane taking off* – Haha, too funny. Tobacco has been VERY popular – something I haven’t added to in years. Look at your weighting form a portfolio value and dividend income and see if it makes sense, you know? Manage that risk/reward! If you continue to believe and continue to act on your fire, you will be beyond where I am! Glad we both reaped the benefits of our first IRM dividend. I look forward to also receiving my first PM dividend in April, although it won’t be as massive as the one you received! Keep rolling that snowball down the hill! IRM was a sleeper, right? Loving them, so far. Looking forward to what they can continue to do and what moat they can try to build. Whoa, those are some blowout numbers, Lanny. Love that outstanding YoY growth and how you just skipped over the $500s and $600s to reach the $700s. Keep that up and you’ll have those expenses covered by next year, even if the property taxes go up again. Three triple digit payers is nice to see. Of course four dividend raises works, too. Just impressive all around. Nice start to 2019! I won’t lie. I was surprised that I crossed those metrics, when I was actually putting this together. Those property taxes are killer. Hoping the value drops, so that the next re-assessment, pushes that lower, right? Agh… damn living expenses here in the States. Congrats to a solid start for the new year Lanny. I know receiving a record-breaking amount of dividends never gets old – but reading about it never gets old either. Looking forward to following your progress for the rest of the year. Thank you. Never gets old, ever. Love the motivation from you and everyone, let’s keep killing it! You didn’t start the year with a bang, you have started it with a BOOM! That YoY growth is beyond amazing particularly when looking at where you were last year. The moves you’re making and all that hard work to make every dollar count is definitely paying off! I’m also loving that IRM payout and I was able to add a solid 1.5 shares on the reinvestment. Keep up the great work, and I cannot wait to see you what you do next year. Whoever said the quarter opening month was a slow month hasn’t checked out your portfolio. Thanks for the shout out on the AFL raise too! What a massive month to start the new year, congrats! Happy to have you as fellow shareholder in PEP, GSK and BHP. That special dividend from the mining giant BHP was a bit a surprise in my view, as I understand it’s from the sale of oil assets to British Petroleum. BHP used the proceeds for the special dividend and to launch a stock repurchase program. Well, I am not sure whether it wouldn’t have been wiser to use some of that cash proceeds to pay down some debt and/or buy new assets to support future growth. Anyway, I guess that BHP sees enough growth levers in its current mining asset portfolio and receiving some additional cash as shareholder is of course a cool think. January was a good dividend month for us as well and we can’t wait to smash the USD 10’000 dividend income milestone this year. The special dividend was oh, so sweet. I think we are starting to see a resurgence in the oil/gas industry and am excited to see the next 12-15 months. I am surprised to see how great January was for everyone. Very pleased with the results. Can February also crush previous traditions of a small month? Tick, tock! Hi Lanny, curious how these ADR’s affect year end taxes? Thanks. Thank you. Some take foreign taxes, depending on the treaties between countries. You receive a foreign tax credit during tax time. This is amazing progress! Your hard work is the proof that I’m on the right path! It’s hard to keep up with the growth when portfolio is big, but your 86% growth is very impressive!!! Thank you, thank you! Think I can do 86% again for January 2020? LET’S GET IT! Thanks for the comment. You’re right, still can survive the bad, and push forward when all is going great. Time to see what February dividend increases show for me. Also, hard to find out what stocks to add capital to, you know? Next to your awesome results, this says it all: “I truly hope that you can see the power of this, in hopes of brightening your financial journey”. Thank you for being you Lanny! You know it. Only person I try to be and want everyone to kill it on this journey!